Monday, May 2 - We are seeing a couple of dozen visitors a day and the most in one day was 74. However, the numbers visiting have grown. We hope that there are others of you who are helping grow Peace from your locale. We have left our cards in places from New York City to Florida and everywhere in between at local businesses. Today is Wednesday, April 24, 2008. Yesterday was the first day that People for World Peace had visitors other than us looking for visitors. There were 5 visitors yesterday and 6 today. This is the beginning. 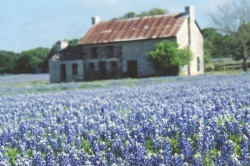 Peace will flourish like the blue bonnets on this Texas meadow. Please begin to post your thoughts on the "Words of Peace" page. Friday, April 25 ..... There have been a few more visitors and we are now at 20+ visitors in the last few days. Soon it will be 20,000. We can and will change the tide of war and unleash a tide of peace in the world. Wonderful ... at last check (3:15 p.m.) today, there had been over 70 hits on this site. It is a good sign.